Review: "Pantommind: Lunasense" - Sea of Tranquility - The Web Destination for Progressive Music! With ten tracks, Lunanse is an amazing accomplishment, as it sees the band growing into a bigger force in terms of composition and performance. It retains all the characteristics of Shade of Fate, yet also adopts a stronger guitar facade with stomping bass lines and complex drumming. Sunny X's lush, symphonic keyboard playing is still prevalant, but there is a heavier focus on the presence of razor-sharp guitars and rhythmic foundations on this album. Three listens of the album will suffice to prove how greatly Pantommind has increased their level of songwriting. Rather than filling their pieces with technical prowess or sappy ballads with the occasional lead solo, the tracks are built around melodic awareness, slowly unfolding with detailed instrumentation and exquisite vocals. The band introduce their new sound with "Erasable Tears," which boasts a wicked bass, propulsive drum and guitar force, and easily ranks among the heaviest Pantommind tunes yet. Tony Ivan sounds as great as ever, and the occasional vocal effects placed on his voice lends the tune an extra dimension. As Ivan delivers the insanely catchy chorus, later repeated by guitars, and then a sick bass lead, some spoken voiceovers, and Tool-meets-Mark Zonder type of tribal drums, it is impossible to ignore how much they have evolved in terms of songwriting. On "Wolf," Pete Christ and Peter Vichew churn out amazing riffs and some of the most engaging guitar solos you will hear in prog metal. The merging of searing fretwork with velvety synth lines and a sturdy bass figure yields one of their best riffs ever. The same riff keeps cropping up in the tune, resurrecting beneath the vocals, drums, and even the instrumental break, which is dazzling itself. Again, Ivan's vocals in the very beginning are unforgettable -- how the voice can become so memorable amidst such musical density is beyond me. As stated before, the level of guitar playing has increased to such heights that it is hard to explain the tunes without mentioning them. On the unconventionally dark "Sandglass," where Tony Ivan's voice is right up there with gods like Dio, Tony Martin, and Rob Lowe, Pantommind venture into a Black Sabbath-like tune with progressive structuring. The acoustic guitars are dark and eerie sounding, the vocals are theatrical; almost becoming the people they are personifying, and the subdued synths solidify the atmosphere all the more with a face-rippingly heavy finale. However, their best has got to be the track sung by Colleen Gray, "To the Days of Old." Unlike the others, this track is very keyboard-based, allowing Sunny X to create dreamy atmospheres a la Psychotic Waltz, but there is of course a good amount of guitar crunch present in the mix as well. If the guitar solo on this tune does not move you, devastate you, crush you, then you are not breathing. It brings to mind a personal favourite, Vito Bratta, where every note has a purpose to serve. Again, the somewhat dreamy vibe of the track sees a heavy finish. Similarly, the guitar theme in the very beginning of "Blank" will leave you shaking. Ivan's more aggressive singing paired with sweeping guitar/keyboard majesty is something we would expect to hear on a Fates Warning disc in the mid-90's -- and Pantommind are great at recapturing the magic of this kind of sounds. The other instrumental, "Transmission Part II," is calm and peaceful, built around a neat piano figure and textural elements. It serves as a diametric opposite to its counterpart, the album opener, which is punctuated by symphonic keyboards, rolling drums, and overlays of sparkling guitar work. More of the instrumental elements shine during the break of "Letter to No One," informed by an amazing vocal part, but it is the solid unison solo between keys and guitars that is so mesmerizing, and brings to mind great passages heard on albums by bands like Sun Caged, Circus Maximus, and Andromeda. It is hard to follow up your debut, especially if it garnered critical acclaim pretty much everywhere in the press. But Lunasense does not disappoint. Actually, I am inclined to dub it as a stronger effort with much replay value. This is an essential prog metal release for 2009. 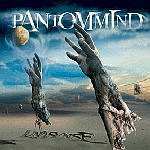 Pantommind finally return to prove that their debut was indeed no fluke, releasing the powerful follow-up Lunasense, a CD sure to impress loyal fans as well as those who didn't check this band out the first time around. Though their debut was a solid slice of melodic progressive metal, perhaps it played things a tad safe at times, but Lunasense sees a band that is more mature, more in touch with their 'metal' sensibilities, and ready to take on the world. Sure, there are plenty of proggy bits here, but the crunch factor has been seriously increased, as the guitars of Pete Christ and Peter Vichew are heavy & chugging, complemented nicely by the symphonic keys from Sunny X. Lead vocalist Tony Ivan sounds a bit more high pitched this time around, but this style fits perfectly with these heavier numbers, as his upper register wailing soars above the bombastic arrangements on tunes like 'Wolf" and "Erasable Tears". Though one can expect a plethora of virtuoso passages, which are the standard of the prog-metal genre, Pantommind keep them somewhat restrained and instead go for powerful drama and intense melodies more often than excessive shredding. One of the highlights here is "Sandglass", a tune that brings to mind Dio-era Black Sabbath (or, Heaven and Hell as they are now called), Tad Morose, Psychotic Waltz, early Fates Warning, and even Candlemass, with its over the top vocals, alluring melodies, and doomy crunch o rama. A gripping piece of work if ever there was one. Production on Lunasense is stellar, the playing impeccable, the songs memorable yet challenging, and the packaging/artwork top notch. Add it all up and you have one of 2009's top progressive metal platters, from a band that has all the tools to go all the way to the top of the genre.